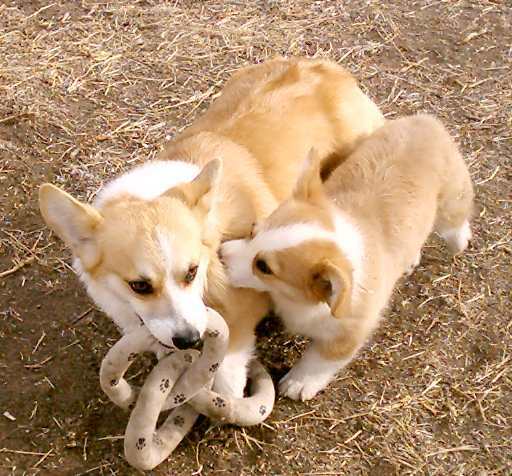 Brady & Solo are Pembroke Welsh Corgis. They have the same sire and Solo's dam is Brady's grandma. They look alike, but their personalities are very different. Brady is very energetic, high-drive, and always challenging. Solo's independent and easily stressed. Brady is three years old (about 8 months older than Solo). Both the boys love agility and going for hikes. Brady has Open titles in AKC & NADAC and P1 titles in USDAA . Solo has Novice titles in AKC & NADAC. He's just started competing in USDAA. Click on the links above to check out their photos!